89. 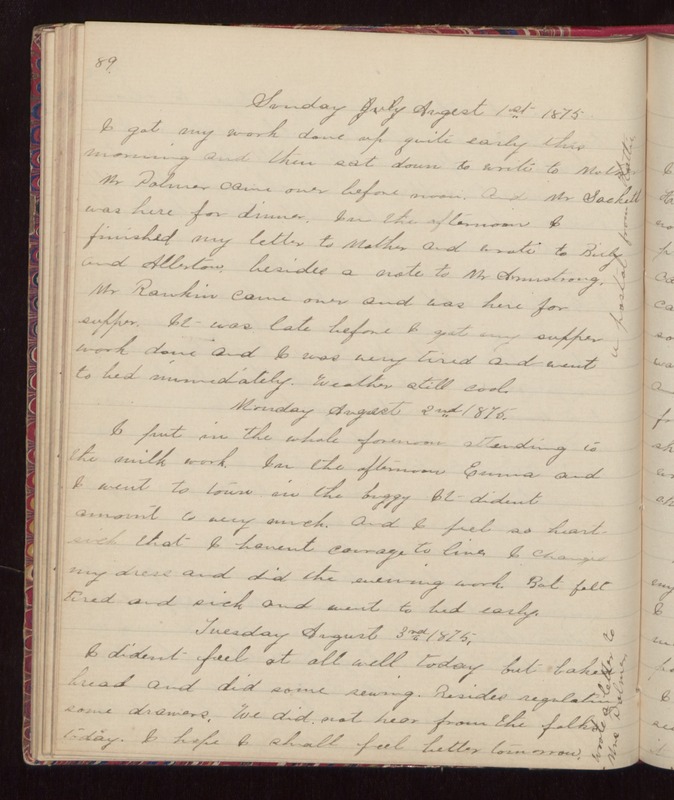 Sunday August 1st 1875 I got my work done up quite early this morning and then sat down to write to Mother. Mr Palmer came over before noon. And Mr Sackett was here for dinner. In the afternoon I finished my letter to Mother and wrote to Billy and Allerton, besides a note to Mr Armstrong. Mr Rankin came over and was here for supper. It was late before I got my supper work done and I was very tired and went to bed immediately. Weather still cool. Monday August 2nd 1875. I put in the whole forenoon attending to the milk work. In the afternoon Emma and I went to town in the buggy It dident amount to very much. And I feel so heart-sick that I havent courage to live. I changed my dress and did the evening work. But felt tired and sick and went to bed early. Tuesday August 3rd 1875. I dident feel at all well today. But baked bread and did some sewing. Besides regulating some drawers. We did not hear from the folks today. I hope I shall feel better tomorrow. Wrote a letter to Mrs Palmer.